This week I wound up my Generations in Film class at the Naval War College, a class I have now taught for a dozen years, including one at Williams College. It is based mostly on movies (and has also been boiled down, in effect, to a two-hour presentation of film clips that I have not yet had an opportunity to give in public.) It includes readings as well, however, and I sent around some before the last meeting--a collection that I had been trying to complete for several years. The four generational archetypes around which generational theory revolves are, as many of you know, Prophets, Nomads, Heroes, and Artists. Today they are represented by Boomers (Prophets), born in the wake of a great Crisis; Gen Xers (Nomads), born during an Awakening; the few remaining GIs (Heroes), along with the Millennial generation, born from about 1982 until sometime early in the last decade; and artists, born during the great crises, including both the Silent generation (born 1926-42) and the new Homeland generation, which began appearing on the scene some unspecified number of years ago. Thomas Jefferson (1743-1826) belonged to the first Hero generation of our national life, the Republicans. By the spring of 1826 he was one of three remaining signers of the Declaration of Independence and received an invitation to celebrate the anniversary in Washington. This was his reply. Like GIs reminiscing about the years from 1941 to 1965 or so, he looked back with justifiable pride on the extraordinary achievement of his generation in its younger days. Respected Sir, -- The kind invitation I receive from you, on the part of the citizens of the city of Washington, to be present with them at their celebration of the fiftieth anniversary of American Independence, as one of the surviving signers of an instrument pregnant with our own, and the fate of the world, is most flattering to myself, and heightened by the honorable accompaniment proposed for the comfort of such a journey. It adds sensibly to the sufferings of sickness, to be deprived by it of a personal participation in the rejoicings of that day. But acquiescence is a duty, under circumstances not placed among those we are permitted to control. I should, indeed, with peculiar delight, have met and exchanged there congratulations personally with the small band, the remnant of that host of worthies, who joined with us on that day, in the bold and doubtful election we were to make for our country, between submission or the sword; and to have enjoyed with them the consolatory fact, that our fellow citizens, after half a century of experience and prosperity, continue to approve the choice we made. May it be to the world, what I believe it will be, (to some parts sooner, to others later, but finally to all,) the signal of arousing men to burst the chains under which monkish ignorance and superstition had persuaded them to bind themselves, and to assume the blessings and security of self-government. That form which we have substituted, restores the free right to the unbounded exercise of reason and freedom of opinion. All eyes are opened, or opening, to the rights of man. The general spread of the light of science has already laid open to every view the palpable truth, that the mass of mankind has not been born with saddles on their backs, nor a favored few booted and spurred, ready to ride them legitimately, by the grace of God. These are grounds of hope for others. For ourselves, let the annual return of this day forever refresh our recollections of these rights, and an undiminished devotion to them. Henry Clay (1777-1852) was, along with his bitter rival Andrew Jackson, the most distinguished member of the Compromise generation, of the Artist Archetype. Ten years old at the time of the adoption of the Constitution, he held nearly every major national office except the Presidency (for which he was defeated) and spent most of his career in the Senate. He was the idol of many Transcendentals (Prophets), including Abraham Lincoln, and hoped slavery might be abolished through gradual emancipation with compensation, although he came from Kentucky and owned slaves himself. In 1850 the break-up of the union threatened over the question of whether California would be admitted as a free state. Here is one of the critical speeches he gave in support of the Compromise of 1850, which secured its admission in return for certain concessions to the South and postponed the Civil War for eleven more years. Nearing the end of his life, he was making a last vain attempt to preserve the great achievement of his childhood. I cannot read this without thihking of the speeches on health care that Clay's fellow Artist Ted Kennedy did not get to make last year and this. “It has been objected against this measure that it is a compromise. It has been said that it is a compromise of principle, or of a principle. Mr. President, what is a compromise? It is a work of mutual concession - an agreement in which there are reciprocal stipulations - a work in which, for the sake of peace and concord, one party abates his extreme demands in consideration of an abatement of extreme demands by the other party: it is a measure of mutual concession - a measure of mutual sacrifice. Undoubtedly, Mr. President, in all such measures of compromise, one party would be very glad to get what he wants, and reject what he does not desire but which the other party wants. But when he comes to reflect that, from the nature of the government and its operations, and from those with whom he is dealing, it is necessary upon his part, in order to secure what he wants, to grant something to the other side, he should be reconciled to the concession which he has made in consequence of the concession which he is to receive, if there is no great principle involved, such as a violation of the Constitution of the United States. I admit that such a compromise as that ought never to be sanctioned or adopted. But I now call upon any senator in his place to point out from the beginning to the end, from California to New Mexico, a solitary provision in this bill which is violative of the Constitution of the United States. “I call upon all the South. Sir, we have had hard words, bitter words, bitter thoughts, unpleasant feelings toward each other in the progress of this great measure. Let us forget them. Let us sacrifice these feelings. Let us go to the altar of our country and swear, as the oath was taken of old, that we will stand by her; that we will support her; that we will uphold her Constitution; that we will preserve her union; and that we will pass this great, comprehensive, and healing system of measures, which will hush all the jarring elements and bring peace and tranquillity to our homes. “Let me, Mr. President, in conclusion, say that the most disastrous consequences would occur, in my opinion, were we to go home, doing nothing to satisfy and tranquillize the country upon these great questions. What will be the judgment of mankind, what the judgment of that portion of mankind who are looking upon the progress of this scheme of self-government as being that which holds the highest hopes and expectations of amelioratirig the condition of mankind - what will their judgment be? Will not all the monarchs of the Old World pronounce our glorious republic a disgraceful failure? Will you go home and leave all in disorder and confusion - all unsettled-all open? The contentions and agitations of the past will be increased and augmented by the agitations resulting from our neglect to decide them. There are few people I never knew to whom I feel closer than W. E. B. Dubois (1868-1963), who was, in word and deed, one of the outstanding representatives of the Missionary Generation. Born in western Massachusetts, he received both a B.A. and Ph.D from Harvard, becoming the first black American to achieve the latter distinction. A brilliant historian, he was also one of the founders and a long-time leader of the NAACP, and the first civil rights leader to advocate full racial equality. (Dubois and I do share one experience: having written major works of American history which our leading professional journal, the American Historical Review, declined to review in their pages, in both cases for reasons of ideological prejudice.) Sadly, he became embittered by slow racial progress and became a Communist in the 1950s, eventually emigrating to Ghana, where he died in August 1963, literally on the eve of the March on Washington. The following remarks were delivered at a 70th birthday celebration for him in 1938, and illustrate the profound truth that the best Prophets have, more than anything else, a gift for life. “I have been favored among the majority of men in never being compelled to earn my bread and butter by doing work that was uninteresting or which I did not enjoy or of the sort in which I did not find my greatest life interest. This rendered me so content in my vocation that I seldom thought about salary or haggled over it. . .I insist that regardless of income, work worth while which one wants to do as compared with highly paid drudgery is exactly the difference between heaven and hell. “I am especially glad of the divine gift of laughter; it has made the world human and lovable, despite all its pain and wrong. I am glad that the partial Puritanism of my upbringing has never made me afraid of life. I have lived completely, testing every normal appetite, feasting on sunset, sea and hill, and enjoying wine, women and song. I have seen the face of beauty from the Grand Canyon to the great Wall of China; from the Alps to Lake Baikal; from the African bush to the Venus of Milo. “Perhaps above all I am proud of a straightforward clearness of reason, in part a gift of the gods, but also to no little degree due to scientific training and inner discipline. By means of this I have met life face to face, I have loved a fight and I have realized that Love is God and Work is His prophet; that His ministers are Age and Death. I had intended, of course, to say something about the outcome in Massachusetts, which, though in the end rather close, has already turned out to be a decisive event in our current political struggles by unquestionably putting the momentum onto the Republican side. Twelve months too late, the President is now trying to pull populist anger to his side, but since he will now be unable to get any meaningful corporate reform through Congress, he is very unlikely to be successful. (Yesterday Paul Krugman, whom as you know I regard as one of my few allies, called upon the House of Representatives to pass the Senate health bill. Good luck, Paul--I don't think it's going to happen.) I had already predicted that younger voters would determine the outcome in Massachusetts (as they had in the last presidential election) and I was right: they gave the Republicans the election by staying home. Only about 20% of them voted (and those went heavily for Coakley), as opposed to more than half of older voters. Yet the point of this particular blog is above all to go beyond the day's events by putting them in historical perspective, and in that sense, the Supreme Court's decision on campaign financing dwarfs the significance of that particular special election. Other decisions on subjects like abortion and gay rights have also swept away long-standing precedents (mostly in state laws), but in one sense, as others have noted, Citizens United vs. Federal Election Commmission can only be compared to Dred Scott. That earlier decision overruled various laws--the Compromise of 1850, the Missouri Compromise of 1820, and even the pre-Constitutional Northwest Ordinance, going back over seventy years. This one goes back even further, undoing a critical principle of the Progressive Era--and therein lies the heart of the matter. The Progressive era, which lasted in effect roughly from 1901 until 1917 or so, was a non-partisan experiment in reform designed to mitigate the effects of the industrial and commercial revolutions and broaden liberties. Leading Progressives included both Republicans and Democrats, including Presidents Theodore Roosevelt and Woodrow Wilson. Their achievements included the implementation of the Sherman Antitrust Act under TR, the Federal Reserve Board under Wilson, and constitutional amendments establishing the vote for women and the income tax. (In one of the great untold stories of American history--one very deserving of a long book--they also included an amendment to ban child labor that passed the Congress but was never ratified by the states.) They also included numerous reforms to improve (as Progressives saw it) the democratic process, including direct primaries (for both state offices and, in some states, for the nomination of Presidential candidates), recall elections, and referendums. Last, but hardly least, under Theodore Roosevelt the Congress passed a law forbidding corporations from contributing directly to political campaigns. All of this came to a crashing halt in the wake of the First World War, but various ideas developed during that era became, after the economic collapse of 1929-32, a big part of the basis for the New Deal--as I learned in my youth from various GI historians like the great Richard Hofstadter and Arthur Schlesinger, Jr.
Large elements of the Republican Party were never reconciled to the New Deal. Those elements, interestingly enough, did not manage even to nominate a Presidential candidate from 1933 through 1963--neither Landon nor Willkie nor Dewey nor Eisenhower or Nixon were diehard free-marketeers. When Goldwater was elected his crushing defeat proved that the United States had come to accept the New Deal consensus. That consensus, however, took a double hit from the civil rights acts of 1964-5 (which alienated the white south) and the Vietnam War (which split the Democratic Party), from which it has never recovered. Meanwhile, conservatism steadily gained ground within the Republican Party, culminating in the nomination and election of Ronald Reagan in 1980. Conservatives took a further step forward when George H. W. Bush was punished for his apostasy on taxes in the 1992 election. That, however, is politics: today I want to focus policy. Conservative Republicans, with plenty of help from Democrats, have been hard at work since 1980 undoing not only the New Deal itself, but the social and economic structure that gave birth to it. The primary electoral muscle of the Democratic coalition came from unions, and union power was largely broken by the long recession under Reagan and the beginning of the de-industrialization of America, as well as by the movement of numerous industries into the un-unionized South. (Those same industries have now moved further south, out of the United States altogether.) Reagan also put a huge dent into the progressive taxation system that had funded the federal government since the Depression, cutting high bracket income taxes while raising the lower-bracket payroll taxes (and putting the proceeds into general revenues, as I pointed out here back in 2005.) Deregulation of S & Ls was followed under Bill Clinton (who restored some fiscal responsibility but did nothing else to fight the ongoing trend) by the repeal of Glass-Steagall and the resultant creation of huge investment banks fueled by depositors' money and credit cards. All this made money more and more important in politics, far more important than either Republican or Democratic ideology. That is why, since the 1960s, no Democratic President has been able to put through a serious liberal reform. Democrats (at least in bluer states) talk a good game at election time, and sometimes put through legislation that looks like change, but a closer reading always reveals the work of lobbyists at play. When Bill Clinton threatened actually to reverse the decline of the government's role during his first year in office with health care reform, Boomer Republicans (led by Bill Kristol and Newt Gingrich) announced that he could not possibly be allowed to succeed and organized all-out opposition, aided by corporate allies. The same thing has happened during the last year. The increasing role of money has two related consequences: it not only insures corporate influence, but discredits the whole process. It was extremely difficult even for a lifelong Democrat like myself to swallow the compromises necessary to get the health care bill through the Senate. The Medicaid concession to the state of Nebraska was a national disgrace, as was the failure to repeal the anti-trust exemption for the health care industry. (How can anyone believe that exchanges will increase competition when the anti-trust laws do not apply?) I'm not surprised that Massachusetts voters were not impressed. Now the Republicans have had to cope with one big problem: their policies are bad for America and bad for the American people. They have increased the gap between rich and poor and stripped working people of fundamental protections. Health care is becoming less and less affordable. Millions have fallen to predatory lending. Worst of all, economic de-regulation has brought back the frequent, devastating boom-bust cycles of the late nineteenth century. All this has led to periodic Republican setbacks at the polls, most notably in 2006 and 2008. (We must keep in mind that we are not fighting today over ideological or aesthetic preferences about the distribution of income in America: we are learning again that allowing rich people to keep too much money simply does not work for anyone but them.) They managed to moderate their effects, however, by packing the least democratic part of our system, the courts. The Progressive era, one might argue, had limited impact itself, but put machinery in place to make the New Deal possible. This week the Supreme Court took apart a critical piece of that machinery by using Citizens United to outlaw any restrictions on corporate campaign spending in the name of free speech. Justice Kennedy's emphasis on "free speech" in his majority opinion, in which he professes devotion to that principle that would rival that of my own hero Hugo Black, is quite Orwellian. Here is how he explained the decision of the court not to decide in favor of Citizens United on relatively narrow grounds--as it easily could have done--but instead to eliminate a centuries-old reform. 1. Because the question whether §441b applies to Hillary cannot be resolved on other, narrower grounds without chilling political speech, this Court must consider the continuing effect of the speech suppres-sion upheld in Austin. Pp. 5–20. (a) Citizen United’s narrower arguments—that Hillary is not an “electioneering communication” covered by §441b because it is not“publicly distributed” under 11 CFR §100.29(a)(2); that §441b maynot be applied to Hillary under Federal Election Comm’n v. Wisconsin Right to Life, Inc., 551 U. S. 449 (WRTL), which found §441b uncon-stitutional as applied to speech that was not “express advocacy or its functional equivalent,” id., at 481 (opinion of ROBERTS, C. J. ), determining that a communication “is the functional equivalent of express advocacy only if [it] is susceptible of no reasonable interpretation other than as an appeal to vote for or against a specific candidate,” id., at 469–470; that §441b should be invalidated as applied to movies shown through video-on-demand because this delivery system has alower risk of distorting the political process than do television ads;and that there should be an exception to §441b’s ban for nonprofitcorporate political speech funded overwhelming by individuals—arenot sustainable under a fair reading of the statute. Pp. 5–12. (b)Thus, this case cannot be resolved on a narrower ground without chilling political speech, speech that is central to the First Amendment’s meaning and purpose. Citizens United did not waive this challenge to Austin when it stipulated to dismissing the facial challenge below, since (1) even if such a challenge could be waived, this Court may reconsider Austin and §441b’s facial validity here be-cause the District Court “passed upon” the issue, Lebron v. National Railroad Passenger Corporation, 513 U. S. 374, 379; (2) throughoutthe litigation, Citizens United has asserted a claim that the FEC hasviolated its right to free speech; and (3) the parties cannot enter intoa stipulation that prevents the Court from considering remedies nec-essary to resolve a claim that has been preserved. Because Citizen United’s narrower arguments are not sustainable, this Court must, in an exercise of its judicial responsibility, consider §441b’s facial valid-ity. Any other course would prolong the substantial, nationwide chilling effect caused by §441b’s corporate expenditure ban. This conclusion is further supported by the following: (1) the uncertainty caused by the Government’s litigating position; (2) substantial time would be required to clarify §441b’s application on the points raised by the Government’s position in order to avoid any chilling effect caused by an improper interpretation; and (3) because speech itself is of primary importance to the integrity of the election process, anyspeech arguably within the reach of rules created for regulating political speech is chilled. The regulatory scheme at issue may not be aprior restraint in the strict sense. However, given its complexity and the deference courts show to administrative determinations, a speaker wishing to avoid criminal liability threats and the heavycosts of defending against FEC enforcement must ask a governmental agency for prior permission to speak. The restrictions thus function as the equivalent of a prior restraint, giving the FEC power analogous to the type of government practices that the First Amendment was drawn to prohibit. The ongoing chill on speech makes it necessary to invoke the earlier precedents that a statute that chills speech can and must be invalidated where its facial invalidity has been demonstrated. Pp. 12–20. 2. Austin is overruled, and thus provides no basis for allowing the Government to limit corporate independent expenditures. Hence, §441b’s restrictions on such expenditures are invalid and cannot be applied to Hillary. Given this conclusion, the part of McConnell that upheld BCRA §203’s extension of §441b’s restrictions on independent corporate expenditures is also overruled. Pp. 20–51. The current crisis in American life, I have been saying here now for five years, will lead either to a kind of New Deal revival or to a return to the Gilded Age. Karl Rove understands this and cited William McKinley as his political hero. The court just brought us immensely closer to a return to McKinley's age. Those like me who never have and never will abandon the New Deal principles they learned in their youth inevitably mourn the likely eclipse, for the rest of our lifetimes, of those principles. But once again my training as a European historian at least enables me to say that things could be much, much worse. Although the Republicans have frequently bent the law (most notably in 2000 and again this week), they have successfully undid the work of our parents and grandparents mainly through legal means. There is no Fascist movement or dictatorship on the horizon (although one could still emerge.) It was the America of the Gilded age to which my paternal grandfather came around 1900, making my own life possible. The liberal tradition will survive, even if will only be revived years after the Boom generation has passed from the scene. (I do not exclude the possibility that my own side might still prevail even in this crisis, but it does not look at all likely.) If the Founding Fathers managed to design a system that can preserve essential liberties and survive even severe swings to the right and left, they will still deserve our thanks. Those of you feeling rather glum this week would be well advised to go to TheDailyShow.com and watch the opening monologues of Tuesday's and Wednesday's shows. I don't know why exactly, but they did make me feel a little better. More to come on the weekend. . . I have frequently noted that Barack Obama has not enjoyed political opportunities comparable to those of Franklin Roosevelt because he was elected in the first, rather than the fourth, year of an economic crisis, and although distress is widespread, our economic and political leadership have not awakened to the depths of the problem we face, as they had by March 1933. In a similar vein, I suddenly remembered a remark from a work of history from several decades ago about the Presidential election of 1928. After showing how a combination of anti-Catholicism and the candidate’s own limitations had led to Al Smith’s catastrophic defeat in 1928, the author remarked that had Smith won, he and the Democracy (as it was then called) would have been saddled with the guilt of the Depression, and Democrats would probably not have returned to power for at least a decade. All this came to the forefront of my mind because of the possibility—which many believe to be real—that a Republican could be elected to the Senate from Massachusetts next Tuesday, reducing the Democratic majority below 60, dooming the health care bill (which Republican Scott Brown promises to oppose) and paralyzing the Senate. But suddenly, another critical analogy came into my head—another election in another major western country, in the same year that Hoover defeated Smith, one that turned out the other way. Weimar Germany was created in 1919 by a coalition of three parties, the Social Democrats, the Catholic Center Party, and the Democratic Party (formerly the Progressives.) That coalition was immediately discredited by the Versailles Treaty—which it decided to sign—and never won a majority in the polls. But in May 1928, after four years of conservative rule, those three parties won a total of 49.8 % of the vote, and formed a governing coalition together with the German Peoples’ Party (formerly the National Liberals, an upper-middle class party, which won another 8.7%), under a Social Democratic Chancellor, Hermann Müller. The Communists, who were hewing to a revolutionary line, won 10.6 % of the vote, and the Nazis just 2.3%. The German economy, like the American, was doing relatively well in the spring of 1928, and Germany now had a center-left government known as the Great Coalition. Meanwhile, the established Conservative Party, the German National Peoples’ Party, which had disillusioned many of its supporters during three years in power, lost a good deal of its support to various fringe parties. Germany had lived during the 1920s on infusions of American capital, and the US stock market crash in October 1929 led to immediate withdrawals and a currency crisis. German unemployment—already high at 8.4% in 1928—shot up to 13.1% in 1929 and 15.3% in 1930. Government revenues fell sharply, making it impossible to meet the new demands on the recently enacted unemployment insurance program, and the coalition broke up over this issue early in 1930. The new Chancellor, Center Party leader Heinrich Brüning, began governing by emergency decree, using the emergency powers written into the Weimar Constitution. He also called new elections, held in September 1930. The three Weimar parties, who had received nearly half the vote in 1928, now got just 44.2, while the Nazis jumped to 18.3 % of the vote and the Communists to 13.1%. With a third of the Reichstag, or Parliament, committed to total obstructionism, the government remained paralyzed, and Brüning’s emergency rule continued for two more years of continuous controversy, local elections, a Presidential vote in which the aged Marshall Hindenburg was re-elected over Hitler, and widespread political violence. By 1932 unemployment had reached 30.1%--the highest of any industrial country. A new election in June of that year gave the Nazis 37.3% of the vote, more than the total of the Weimar coalition, and the Communists 14.3%. Now the largest party in the Reichstag, the Nazis had earned a role in the government, but could not form a coalition with the Center. Yet another round that November saw the Nazis fall to 33.1% and the Communists increase still further to 16.9%, while the Weimar coalition attained 37.2%. But Hitler managed to come into power in a coalition with the traditional conservative party. The Reichstag fire—a terrorist act, we now know, of a mad anarchist—allowed him to proclaim emergency powers and deputize the SA and SS as police auxiliaries, and the Reichstag voted its powers out of existence a few months later. It is now exactly 80 years since 1930. The election in Massachusetts this Tuesday—which at the very least promises to be much closer than anticipated—offers a preview of what could happen in the fall. The United States isn’t Weimar Germany, not least because of our well-established two-party system. But the Tea Party movement is busily taking over the Republican Party (and in effect already controls its powerful propaganda ministries on Fox News and Clear Channel, something the Nazis never enjoyed.) That movement is based largely upon paranoia and absurd theories about who controls America, what the Obama Administration is doing, and why. (Rush Limbaugh, to whom I listened for a while today, insists that Obama has purposely wrecked the economy to make a statist takeover possible. He could not conceal his excitement over the possible Republican victory in Massachusetts and what it might mean.) And of course, one of their tactics is to pin the Fascist/National Socialist label on President Obama, a moderate liberal. Now while I am not accusing the Republican Party or the Tea Party movement of Fascism, I do think that we are now threatened with a complete collapse of national authority, brought about in large measure by their mad ideological excess and hatred of liberal elites. Certainly, as a story in today’s New York Times suggests, the Tea Party movement has established itself as the most organized and determined nationwide political movement that we have. Whether the Republicans win in Massachusetts on Tuesday or not, they seem very likely to make gains in the fall. Any gains in the Senate will mean the total paralysis of the government for two years, similar to what happened in Germany in 1930-2 or in France in the mid-1950s (when de Gaulle also used emergency powers, sometimes of dubious legality, to get France back on track.) Let us hope that we do not also have an outbreak of domestic political violence. After the rise of the Nazis and the Second World War, thousands of trees were felled to try to uncover the unique features of German history that could have led to this catastrophe and the strength of the American political tradition that had allowed us to avoid such a fate. The idea that Germany and the United States were facing a periodic crisis (as they had, with very different results, in the 1860s), and that luck had an enormous amount to do with determining their respective outcomes, did not occur to very many people. 80 years later it seems more and more obvious. Like the Germans in the early 1930s we are deluged with destructive, irresponsible propaganda 24 hours a day. Like them, we have a significant minority of the population that believes our government is a vast conspiracy attempting to destroy our values. Like them, we have undergone several important foreign policy setbacks (although nothing, certainly, on the scale of the loss of the First World War.) Like them in 1928-30, we have a center-left government that has failed to respond adequately to popular resentment. Like them, we are on the brink of total government paralysis. Our hope, as I pointed out last week, remains the younger generation that put Obama in the White House. Let us see if they can save Martha Coakley on Tuesday and reassess after that. The first year of the Obama presidency is nearing its conclusion--the first year of a long struggle that will shape the United States for at least the next thirty years, just as the Civil War and its aftermath created the America of the Gilded Age and the Great Depression and Second World War built the world in which I grew up. In the midst of any political struggle, as in any war, one must guard against premature assessments or flights of either optimism or pessimism, but the results of this year, like those of 1861 for Northerners or 1942 for the US in the Second World War, have been disappointing, and do not, to me at least, hold out enormous hopes for the future. Let me survey the scene as I see it and at least lay out some alternatives for this even more crucial year. Barack Obama won election by a substantial majority, in my opinion, for three reasons: the widespread disgust with the Bush Administration, the emerging economic collapse, and the advent of the new generation that provided him with his majority. The same mixture gave the Democratic Party a comfortable majority in the House of Representatives and exactly 60 votes in the Senate--a possible basis for decisive action on health care, domestic economic policy, and in foreign affairs. The President initially took advantage of the situation to pass the stimulus package, which almost surely has prevented things from getting even worse. An entire year of bitter struggle has now yielded a very moderate health insurance reform bill, which is likely to pass during the next month. Neither on the broader economic front, however, nor in the implementation, as opposed to the presentation, of foreign policy, has Obama made many very significant changes. And as a result, he has as yet not only failed to lay the foundation for a better American future, but he also may have lost the political momentum and allowed the Republican Party, however bereft of either ideas or outstanding personalities it may be, the possibility of a comeback. The problem, it seems to me, stems above all from the continuing, unchallenged power of both economic and foreign policy elites who refuse to admit that there might be anything fundamentally wrong with their policies and beliefs. The last few years have convinced me and others (such as Paul Krugman and James Galbraith, as well as some multi-millionaire hedge fund traders who recognized what was wrong in time) that our economy is fundamentally dysfunctional from the standpoint of the average American and needs drastic changes. The financial sector now dominates the economy and generates huge private fortunes, but without producing great increases in employment even in the best of times--indeed, its profits often depend on wrecking more productive sectors of the economy. And those in charge of it, including Ben Bernanke (a most revealing choice as Time's Person of the Year), Tim Geithner, and Larry Summers, have made it very clear that they see nothing with the system as such, and indeed are very proud to have reinvigorated it, at least temporarily, with massive infusions of federal cash. Worst of all, they have managed to keep the real solutions we need entirely off the political table. Last weekend Steven Brill wrote a long article in the New York Times Magazine about federal attempts to use TARP to control executive compensation at a few firms without even mentioning the only effective, and actually quite obvious, solution: a return to confiscatory marginal tax rates on incomes of, let us say, over $2 million a year. Stories suggest that the Obama Administration might even suggest keeping some of the Bush tax cuts that were set to expire this year or next, and the idea of re-instituting something like the Glass-Steagall Act has not been discussed either. On the one hand, the Democratic leadership reflects the values of Wall Street; on the other, it seems still to be terrified of confirming Republican stereotypes about tax increases. If you believe, as I do, that the structural weaknesses of our economy once again require drastic reforms, then we can only expect further economic stagnation, or worse, during the next twelve months. In foreign policy the President certainly struck a much more encouraging and courageous note during his first six months in office. The withdrawal from Iraq remains a real achievement, and the President's speeches abroad, especially in Cairo, not only seemed to confirm that the United States was on a truly new course, but also won the President his Nobel Prize. Last fall, however, he faced a critical decision: whether to adopt his predecessor's view that that the security of the United States required a friendly government in control of Afghanistan, however remote the prospect of such might be. Once again, as in the economic front, he had to rely upon establishment advisers, including Richard Holbrooke, Hillary Clinton, and Robert Gates, who refused to challenge the fundamentals of that policy. That led him to increase our commitment, while trying to make sure that the trend would be reversed within a couple of more years. (An important article which appeared on the day after Christmas suggests that disagreement persists over exactly what has been decided.) That means that the United States will continue to exchange predator strikes and artillery rounds with the enemy's suicide bombers and ieds, but on a larger scale. It also means that any successful attacks on airliners or in the United States itself--which Al Queda may be using to try to ensure that American troops remain in the heart of the Muslim world--will be interpreted as failures of his policies. And it will probably forfeit a significant portion of the good will that the President initially enjoyed around the world. Now the election looms. The Washington world is now agog over the retirements of Chris Dodd and Bryan Dorgan. I will not miss Dodd, whose connections with Countrywide Mortgage and the hedge fund industry made him exactly the kind of Democrat I am railing against, and the Democratic Party should have no trouble finding another winner in Connecticut. Dorgan's seat, however, will be vulnerable. In any case, the House in particular now includes several dozen Democrats who were elected in 2006 and 2008 simply because they were not Republicans. If the economy has not rebounded, they may have difficulty persuading their constituents that they should be re-elected. In the Senate, the loss of even one seat will apparently make it impossible for the Democrats to accomplish anything meaningful for the last two years of the Obama Administration. Every story coming out of Washington now suggests that the White House is focusing on new communications strategies to deal with this most unfortunate situation. That is another legacy of the last forty years, in which powerful men and women have done whatever they could to detach politics from actual events on the ground. It is in the nature of crises, however, that they pose problems, such as secession or mass unemployment or world war, which demand real solutions. That, in my opinion, is where the President must keep his focus--even, or especially, when it involves disappointing the establishment figures who surround him. It is most unpleasant to contemplate the consequences of significant Republican gains this fall. The wild card in the situation remains the Millennial generation, which, to repeat, elected the President in the first place and which, like the GIs in the 1930s, may not take their cues from the established media. 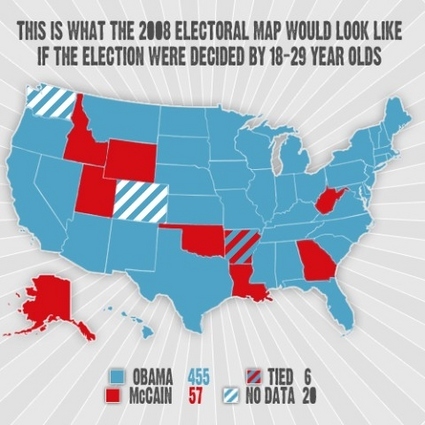 The following electoral map, just posted on the usually reliable juancole.com, offers the Democrats a great deal of hope for the future and could indeed promise a new transformation of American politics. Can these young voters be mobilized on behalf of Democratic House and Senate candidates this year, while they struggle to find jobs? If they can Obama may astonish the nation and we may begin to move forward. If not, we are doomed in the short and medium term to paralysis, and very bad outcomes for the crisis remain very possible. Over the past week I have read a remarkable book, A World of Trouble, on the United States and the Middle East, by a journalist, Patrick Tyler, that combines both serious historical research and Tyler’s own reporting from the 1980s to early in the decade that is now coming to an end. Covering half a century of history, it runs to 554 pages of text and extensive and impressive endnotes that draw about equally from primary sources (including Henry Kissinger’s telephone conversations), a wide range of secondary sources, and the author’s own interviews. (Some parts of the book reflect Bob Woodward’s techniques, and those who granted lengthy interviews—led by Prince Bandar, the long-time Saudi Ambassador to the United States—play leading roles in the story.) It would be quite easy to write a review essay of at least thirty pages on the book, but I will try to keep my remarks relatively brief and general. Tyler has one recurring theme: that with the possible exception of Jimmy Carter and, briefly, George H. W. Bush, no President has ever really understood the Middle East, largely because none but Carter (whose interest in the Holy Land was a big help) has ever devoted the time and energy to understanding its complexities. (This failure also extended to Gerald Ford, whom the book almost entirely ignores. A well-connected CIA analyst once told me that Ford’s briefers had never managed to get the President much beyond the essential differences between Arabs and Israelis.) Thus he implies that greater concentration might have produced better results, and with respect to one crisis—the fall of the Shah in 1979—he implies that more forceful advice from President Carter might actually have changed the outcome—an idea I find debatable in the extreme, not least because of his own evidence. Although Tyler focuses on presidential leadership, the book has another related subtheme—the anarchy of US policy towards the region. So many Presidents have been distracted by so many problems—Johnson by Vietnam, Nixon by Watergate, Reagan and Bush II by their generally short attention spans, and Clinton by his personal scandals—that powerful officials—led by Secretaries of State Kissinger and Haig—have often been able to go off on their own, with highly negative results. Kissinger, Tyler shows clearly, lied to Nixon during the Yom Kippur War, promising to work for an immediate cease-fire while telling the Israelis to push their counterattack. Haig seems to have told the Israelis to go ahead and invade Lebanon in 1982 without trying to explain to Reagan what this was going to mean. Under Bush II—in an episode I have mentioned here many times, but which Tyler, surprisingly, leaves out entirely—a neoconservative gaggle within the Administration apparently persuaded the President to announce publicly that Israel could not be expected to return to the 1967 borders and could keep any settlements it wanted in a possible peace. Both sides of the Arab-Israeli conflict have contributed to our confused policies by cultivating influence wherever they could. The Israelis, of course, have focused on the Congress, where they now enjoy an extraordinary stranglehold over both parties through AIPAC. Some Arabs—in particular the Saudis, led by Bandar—have focused on Presidents and potential Presidents, resorting more than once to disguised forms of bribery. I did not know, for instance, that the Saudis had presented Ronald Reagan with some fine native racehorses and Nancy Reagan with $2 million worth of diamonds while he was in the White House. Because the US Constitution prohibits such gifts, they were initially transferred to third parties, with the Reagans taking full possession after they left office. Bandar and his superiors in Riyadh—who seem to become quite sophisticated in reading American political tea leaves—actually anted up $3 million for Middle Eastern studies program at the University of Arkansas while Clinton was still governor. After his election to the White House they added the additional $14 million that the governor had asked for. I learned a very great deal from this book, which deserves a much wider audience than it is likely to get, but I think that Tyler has missed a larger and more critical point. The United States (and its ally Israel) have failed repeatedly in the Middle East because “progress,” from their point of view, depends on that region being something other than it is. Again and again, both Washington and Tel Aviv have acted as though they could bribe, covertly influence, or militarily compel Middle Eastern leaders into doing their bidding—and most of the time they have made things worse than before they started. The obvious solution, clearly, would be to leave well enough alone, which for the United States would also involve substantially reducing our dependence on oil. President Obama’s decision to escalate in Afghanistan unfortunately shows that we have embarked upon the same disastrous course once again, in the groundless hope that this time, things will finally turn out differently. The history of misadventures goes back at least until 1954-5, when the Egyptian nationalist leader Gamel Abdel Nasser decided to expel the British Army from Egypt. The Israelis, who in the first five years of their existence had depended partly on the British to keep the weak Egyptian monarchy of King Farouk in line, actually reacted by starting a Mossad terror campaign in Cairo against British and American targets, in an effort to estrange the British from Nasser and get them to stay or overthrow him. When the plot was uncovered and several Israeli agents executed, cross-border incursions into the Gaza strip began. The Israelis, as has been their custom ever since, escalated these raids when they sent a military unit into Gaza, attacked an actual Egyptian military camp, and killed more than 30 soldiers. (I remember a shocked Jewish-American grad student telling me that story thirty years ago.) Those events made Nasser a more determined enemy of Israel. When he nationalized the Suez Canal and began flirting with the Communist powers, the Israelis made an alliance with the British and French (who wanted the canal back) and seized the Sinai for the first time, only to have President Eisenhower force them out of it. A similar round of provocations led in 1967 to the Six Day War. Many historians have now concluded that Nasser did not want war—although he did expel UN peacekeepers from Sinai and move troops into it—but the Israelis decided to take advantage of the dangerous situation to launch an attack and take the Sinai, the West Bank, and the Golan Heights. This time Washington was much too distracted to head the war off because of Vietnam, and when the Soviet Union stepped in to re-arm the Arab powers, the second phase of the Arab-Israeli struggle began. Between 1968 and 1973 the Egyptians and Israelis fought a “war of attrition,” mostly in the air. I did not know until I read Tyler that Golda Meir’s government was telling the US that bombing Egypt proper would bring down Nasser’s regime, a necessary precondition, they said, to peace. Perhaps that argument appealed to Americans because of our parallel effort against North Vietnam—but both attempts to win decisive victories with air power failed. The breakthrough in relations with Egypt came first because Anwar Sadat, who took over when Nasser died suddenly in 1970, initially surprised the Israelis with his attack across the Canal in 1973, and then, in 1977, dramatically offered to come to Jerusalem, addressed the Knesset, and offered peace and full recognition of Israel in return for land. The move towards peace was short-lived. In the same year, 1979, in which the Egyptians and Israelis signed their peace treaty and the Soviets invaded Afghanistan, the United States lost the Shah of Iran, its most prized Muslim ally, to a broad-based popular revolution of which religious forces managed to seize control. That should have been a lesson: the Shah had owed his throne to an American and British sponsored coup in 1953, something Iranians have never forgotten. An excessively pro-western orientation had already emerged as a danger to Arab rulers in 1957, when military officers had overthrown the Hashemite King Faisal of Iraq, paving the way within five years for Ba’ath Party rule. Two years later, Sadat, still a pariah among the Arab world, was assassinated by dissident Arab Army officers. In that same year, 1981, Saddam Hussein’s Iraq attacked Iran. Tyler presents extraordinary new data on the extent of American involvement on Saddam’s side of that war later in the decade, when unofficial American advisers were using satellite imagery to plan attacks on Iranian positions and doing nothing to stop Saddam’s extensive use of chemical weapons. He does not however answer another question that has bothered me for years: how much encouragement Saddam might have gotten from western powers for the decision to start the war in the first place. By 1988 the US Navy was effectively fighting alongside Saddam as well, engaging in April of that year in perhaps its biggest surface engagement of the post-Second World War II era against Iranian ships. In 1990, having finally forced Iran to make peace with so much American help, Saddam Hussein invaded Kuwait. This time, for once, the United States stumbled upon a sensible policy: the recovery of Kuwait (a relatively straightforward military operation) without an attempt to install a more friendly regime in Iraq. (Tyler, who covered the war, notes however that the US air campaign was much more destructive, and had much more long-lasting effects on the Iraqi people, than Americans understood.) But the Bush and Clinton Administrations could not stop there, and began encouraging various disastrous attempts to overthrow Saddam with the help of Kurds, exiles, and Iraqi generals willing to defect. The defeat of Saddam, on the other hand, forced Yassir Arafat and the Palestinians to give up any dreams of Israel’s imminent defeat, and serious peace talks began. Here emerged the second doomed hero of the story, Yitzhak Rabin, an old soldier who had decided that Israeli military power had done all it could do for the Israeli people and that the time had come for retrenchment and peace. Substantial Israeli constituencies, both religious and political, were now determined to keep the entire West Bank, but he began giving parts of it up. For this he, like Sadat, was assassinated in 1995. Arafat proved unable to control Palestinian terror as well, and more warlike elements on both sides moved into positions of power. The idea that Arabs could be compelled to behave as Israelis and Americans would like took over the White House in 2001-2 under George W. Bush, who decided that Arafat—who had actually always been a moderate by Palestinian standards—had become the key obstacle to peace, and demanded that the Palestinians elect a more pacific successor. Instead they elected Hamas, forcing the Americans, Europeans and Israelis to support Arafat’s successor, Mahmoud Abbas, while undermining his legitimacy. Realizing that he had angered the Arabs, Bush called publicly for a Palestinian state, but also announced that Israel would keep settlement blocs in a peace. After September 11 Bush threatened to take down any Arab regime that supported “terrorism”—which, thanks to the now-unchallenged conventional military supremacy of the Americans and the Israelis, had become the only option other than submission for any opponents. He did remove the Taliban in Afghanistan and Saddam in Iraq, with incalculable human cost and little observable gain for American interests as yet. But despite the complete failure of the policy of acting militarily against Islamic regimes that directly challenge our interests and trying to replace them with clients—a disaster in both Palestine and Iraq—President Obama has now decided to invest more heavily in it in Afghanistan. That policy, like reflexive anti-Communism in the 1950s, seems to have become a new Washington consensus, and the President is a consensus-builder. . In my opinion, American military action in the Muslim world—the enterprise which General Petraeus’s mentor, retired General Keane, successfully urged Petraeus to take over as CENTCOM commander in 2008—will inevitably make terrorist attacks on the US more, not less, likely. The Nigerian who tried to blow up a an airliner on Christmas day came, like many of the 9/11 hijackers, from a well-off family and had lived in the West. He was presumably inspired by the American wars in Iraq and Afghanistan. Those wars make tens of millions of Muslims very angry; of those, a few thousand, perhaps, become willing to commit a terrorist act; and of those, a few manage to find their way to somewhere (in this case, not Afghanistan or Pakistan, but Yemen) where they can be trained to do so. In this case the training was evidently inadequate, for which we can be thankful. But there will be more. In Israel, for more than half a century now, the government has repeatedly responded to terrorism with conventional military action. It hasn’t worked. The United States has already taken responsibility for Afghanistan and Iraq, which have more than 50 million people, and Yemen has 20 million more. We simply cannot stop terrorism by intimidating those populations or establishing friendly, cooperative, effective governments within them. Tyler’s story proves that.